In the best selling book “Idea Virus,” Seth Godin likens the spread of information online, to the particles of an infectious virus. Note this is not just theory, but an observation of how effective messages move through the lines of digital communication. This constant influx of information often overloads one’s ability to effectively interpret and properly categorize a majority of these incoming messages; thereby creating a need for information aggregates. The fracturing of traditional offline information into mobile bite-sized info bits is creating a seemingly endless supply of emerging micro-real-estate-markets. Why not be the local information aggregate for your new home community? Online home buyers prefer their home search information to be well filtered, and thoroughly refined… research and aggregate all of the home buying related information for your area with the intent on sharing it with your prospects. Then use your new home sales blog to filter your competitors’ real estate marketing and sales messages to the bottom of the search engine pile, and present yourself as the local real estate market expert. Have you heard the term viral marketing? Viral marketing is a term used to describe a message or information that spreads quickly, effectively, and contagiously through networks of friends, families, and third party relationships. Quickly – the viral message is usually passed on effortlessly, as in email, websites, or by word of mouth. Effective – the same message (whether broad or specific) usually reaches the intended recipient because it originated from a “trusted” source, and it’s effects can be measured. Something similar can said about our new housing economy that is developing in the United States. Information should be fluid (like water at room temperature,) yet the new home information received by the public is being put under abnormal and unbalanced scrutiny at the hand of media networks. While large media conglomerates are slowly trying to understand the new social media, they still revert to these old standards, even though they are rapidly losing effect. Instead of following money losing, failing business models – why not lead a following through the new medium of social information marketing? In your industry, market area, and section of the world – aren’t you the expert? Why not create your own media empire? Deliver your own new home sales message to your prospects. Today, home buyers are being “pressured” by a one-sided argument that now is not a good time to buy a new house. Try as you may to deliver the opposite message, currently you do not have enough credibility with the home buying prospects to change their mind or perception. Why? The message and information you provide is one sided to your benefit – and it shows! Every time home builders open their mouths, it is usually to blatently benefit themselves with the sale of a new home. Nobody wants to hear about you – they want to hear about things that interest them! Traditional media outlets generate revenue through advertising (which the value or cost of said revenue is relative to the attention by which the message attracts.) Usually, the message recipient does not always relate the two because “the sale” is usually not a direct byproduct of following through with the action that the advertisement requested. Home Builders only generate revenue from the construction of homes, right? Today, cost effective web technology fused together with online communities, AKA “social media” allows any business – even home builders to create a dynamic, and compelling audience centered message that when delivered in a viral medium can nearly equal the effect of the traditional news outlets. Stop being a pawn in the media giants game of doom and gloom that is aiding the destruction of your business. Instead, take that budgeted money and start a conversation that new home prospects want to engage in! (And not one about yourself,) make it about them, and use social media to do it. 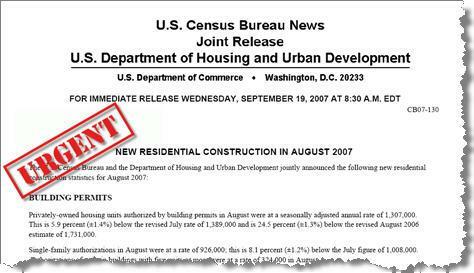 Just in cased you missed it, here is the latest US Census Bureau Release for New Home Construction Data. What are you and your organization doing to help shore the loss of new home sales?